Paul Michael Slayton was born on 11 March 1981, in Houston, Texas USA, and under his stage name of Paul; Wall is a rapper, promoter, and disc jockey, probably best known for releasing several solo as well as collaborative rap albums during a career which began in the late ’90s. 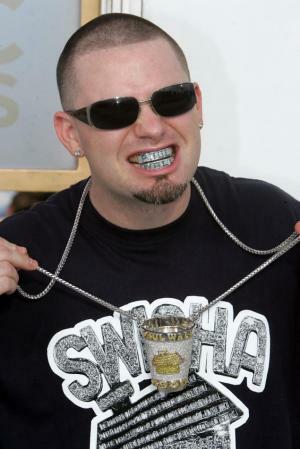 How rich is Paul Wall? According to authoritative sources, Paul’s net worth is estimated to be $12.5 million, the majority of which he has accumulated through his commercially profitable career in the music industry now spanning almost 20 years. Paul Wall was educated at Jersey Village High School, but didn’t actually graduate from the University of Houston despite studying mass communications for almost three years – his music was more important. He began his career by doing promotions for the independent rap label “Swishahouse” owned by Michael “5000” Watts, “Cash Money”, as well as “No Limit Records”. After convincing Watts to let Paul and his friend Hakim Seriki, known as Chamillionaire, rap on his radio show, the duo became an instant hit with the local audience.They were featured on one of the mixtapes entitled “Choppin Em Up Part 2”, which not only earned them local recognition, but guaranteed a place in the “Swishahouse” label, and began his accumulation of wealth. Eventually, Paul and Chamillionaire formed “The Color Changin’ Click”, a rap group that brought them a lot of business opportunities, the most notable of which was a contract to record an album with Paid in Full Records. The contract resulted in the release of the group’s debut album “Get Ya Mind Correct”, which peaked at #67 on the Billboard charts and sold over 150,000 copies. Wall’s successful beginnings as a rap artist significantly contributed to his estimated net worth. However, soon the group disbanded, and as Paul and Chamillionaire parted ways, Wall returned to “Swishahouse”. He then appeared in Mike Jones’ commercially successful single “Still Tippin” and released his first solo album; “The Peoples Champ” proved to be extremely successful, peaking at #1 on the Billboard 200 and producing three singles. Paul Wall’s second album “Get Money, Stay True” was equally as successful, peaking at #1 on the Billboard Chart Top R&B/Hip Hop Albums, and produced two singles: “Break ‘Em Off” with Lil’ Keke, and “I’m Throwed” with the rapper and producer Jermaine Dupri. During his rapping career, Paul Wall has collaborated on several projects with a number of artists, such as Collie Buddz, Slim Thug and Tucker Max, all of which contributed to his net worth. In 2008, Wall joined Tech N9ne and Ill Bill on their nationwide tour, and appeared alongside other celebrities for Nickelback’s video “Rockstar”. In addition to his collaborations and solo projects, Paul Wall has starred in several movies and TV series as well. In 2009, he portrayed a fictional rapper in a comedy film written by Tucker Max “I Hope They Serve Beer in Hell”, for which he also co-wrote tracks. Several years later Paul appeared in an episode of “CSI: Crime Scene Investigation”, alongside Yelawolf and Christina Millian, and starred alongside Ja Rule in a horror film directed by William Butler – “Furnace”. Paul Wall currently works on his studio albums, and is a member of a rap group called “Expensive Taste” together with his friends Travis Barker and Rob Aston, simply known as Skinhead Rob. In his personal life, Paul Wall married Crystal in 2006, and they have a son and a daughter. 1 Gave his son the middle name Patrick Hawkins after late Underground Houston rapper, Fat Pat aka Patrick Hawkins. 2 Wife Crystal gave birth to their first child together, son William Patrick Slayton, on April 18th, 2006. 4 Studied mass communications at the University of Houston for three years before dropping out to pursue music. 5 Owns a lucrative business as a maker of diamond-studded "grilles" which is hip-hop slang for expensive dental caps. I Hope They Serve Beer in Hell 2009 performer: "One in a Grillion"
Grandma's Boy 2006 performer: "Sittin' Sideways"
Madden NFL 2006 2005 Video Game performer: "They Don't Know"